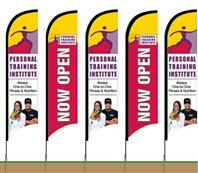 The flutter flags are an excellent low cost business marketing product. Easy to install and maintain, these colorful eye catchers will help increase business beginning the first day. Strategically positioned next to the road or by your store, feather flags impress your business in the customer's mind.